I often see Hibiscus Flowers when I travel around the coastal area of West Papua. They can be seen growing in the wild, on the roadside, and in the front-yard of villagers' houses. The red hibiscus flower on the right was in Arfak mountains at the foot of Mount Soyti around 1,300 meters above sea level. I saw it at the backyard of a guest house that was usually used by birdwatchers. According to wikipedia there are hundreds of species of hibiscus plants with a wide range of color variations such as red, pink, white, yellow, and multi colors. Big birdwing butterflies like to eat nectar of hibiscus. Because I like art, I have made some manual and digital drawings of pink hibiscus flower and butterfly. It is now available as print art and can be ordered online. Because I work as a tourist guide in West Papua, I often travel with visitors to a lot of places. 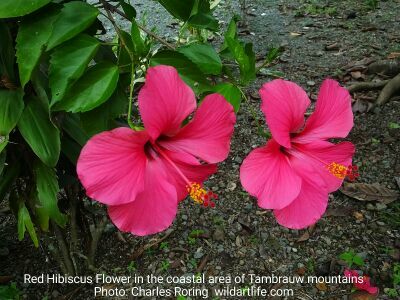 During the trip to remote areas, I saw numerous species of hibiscus flowers along the coastal and mountaineous regions. 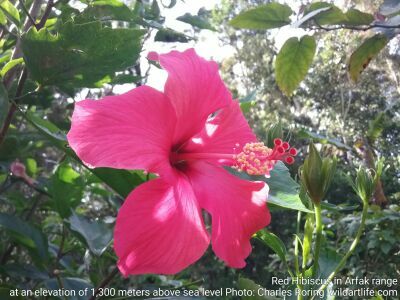 For example, I saw large red hibiscus flowers in Arfak mountains at an elevation of approx. 1,300 meters and at the coastal area of Tambrauw regency not far from the beach. They look the very similar. However, I don't know if they are from the same species. Tambrauw regency can be reached by car, airplane and boat from both Manokwari and Sorong. It is not only a place to see wild flowers but also a highly recommended site to watch birds and wild animals. People like to grow hibiscus plants around their houses because they can make the landscape more beautiful. Since the hibiscus shrubs are big, they can filter flying dust in the air for houses that are built near the road. They also reduce traffic noise. In addition to hibiscus, I often see a lot of species of wild flowers when I travel in lowland and lower montane forests as well as in mountaineous area. Some of them include bougainvillea, terrestrial orchids Spathoglottis plicata, Spathodea campanulata, or the water hyacinth Monochoria vaginalis. White Ground orchid - in lowland forest of Tambrauw regency. I was guiding some visitors from the United States and Hongkong on 4 day/ 3 night riverwalk and camping tour when I saw this terrestrial white orchid. I approached the orchid flowers trying to check whether its flowers emitted fragrant scent. Yes, it did. Unfortunately, I did not know its Latin name. Glory Vine (Faradaya splendida) - along the sides of rivers in lowland area of West Papua. On the internet, it is also called Vigorous Twining Climber. The flowers are abundant. They need a lot of water and good sunlight to grow well. Rhododendron konori - on tops of Arfak mountains especially at the elevation of 2,000 meters to nearly 2,900 meters above sea level.